Buildings along a block of Merrimack Street in downtown Haverhill will be demolished to make way for a mixed-use development, including a satellite campus for UMass Lowell, that will also open access to the riverfront. The Merrimack River flows through downtown Haverhill mostly out of public view, hidden behind a concrete flood wall and old brick buildings. But now the river is poised to take a star turn with Harbor Place, a development that promises to bring a new dynamic to Merrimack Street. Office and retail space, apartments, restaurants, and a boardwalk are planned as part of the multimillion-dollar project proposed by the Greater Haverhill Foundation and the Planning Office for Urban Affairs in Boston. An entire city block — starting at the old Woolworth building at the corner of Main Street — will be torn down starting in spring, opening up 1½ acres of waterfront land. 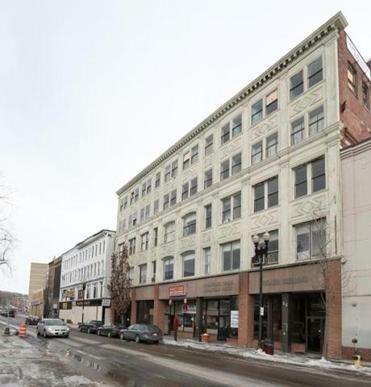 A seven-story building — anchored by a satellite campus of the University of Massachusetts Lowell, will replace the Woolworth building, vacant since the five-and-dime store closed 45 years ago. Harbor Place promises big change for downtown Haverhill. Construction on the $17.5 million building is expected to start in the fall. An underground parking lot will have 150 spaces. A multistory apartment building will be built next door, with the number of units to be decided later, officials said. Mayor James J. Fiorentini said he hopes Harbor Place will create a hip vibe in Haverhill. A boardwalk, pathways, and a public plaza will create new access to the river. A public boat dock is on the drawing board, too. The development will be built on a platform raised to the height of the flood wall, opening up a new view of the river. Some merchants on Merrimack Street are excited by the prospect of renewal. “I’m hoping the housing will bring more people to my business,” said Jasber Ghandi, owner of J & M Dollar Discount for nine years. Although privately financed, Harbor Place will benefit from $10 million in state MassWorks grants awarded to Haverhill in recent years. In 2012, a $4 million grant was used to help cover the cost of raising the flood wall by 2 feet, to comply with a federal mandate. The 32-foot wall keeps the river from overflowing during a flood. A $5 million grant announced by Governor Deval Patrick last November will be used to pay for the boardwalk and other infrastructure related to the development. Haverhill state Representative Brian S. Dempsey, chairman of the House Ways and Means Committee, said private financing was essential for the project to qualify for state assistance. “We needed to see some level of commitment from the private sector,” Dempsey said during a recent walk along Merrimack Street. The Greater Haverhill Foundation, a nonprofit business group, bought the former Woolworth building nine years ago for $1.4 million. But in a stagnant economy, the property drew little interest. A development opportunity did not emerge until last year, when the foundation paired up with the Planning Office, a nonprofit housing developer. The developers purchased four adjacent properties, stretching from the Woolworth store to the Ocasio building. Demolition of the buildings will create new value along the river, the developers said. “The key to the whole revitalization is to create real, open pathways to the river,” said Lisa Alberghini, president of the Planning Office for Urban Affairs, which is affiliated with the Roman Catholic Archdiocese of Boston. Although most often associated with redeveloping former church properties, the Planning Office also has a vast private portfolio, Alberghini said. Harbor Place will be built in phases. Construction of the commercial building is due to start in the fall. Details of the residential property are still being worked out. The 81,500-square-foot building will also have ground-floor restaurants and retail space. Office and educational space will be built on top. UMass Lowell plans to occupy the second and third floors, Meehan said. With more than 2,000 students living in the Haverhill area, UMass Lowell opened its first satellite campus last fall in temporary space at Northern Essex Community College. About 100 students have enrolled in courses, ranging from business finance to human sexuality, offered through Division of Online and Continuing Education, according to the university. A permanent home at Harbor Place should allow more course offerings, and a chance for Riverhawks pride to soar higher. @globe.com. Follow her on Twitter @GlobeKMcCabe.